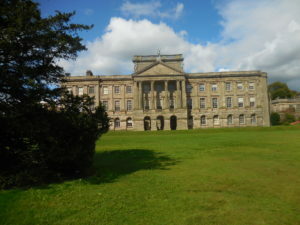 Just before the 2017 Country House Tour began, Kristine Hughes Patrone, Sandra Mettler, Delle Jacobs and I met up at our hotel and made a visit to Lyme Park, which became an icon for lovers of Jane Austen’s Pride & Prejudice when it was used for the exterior shots of Pemberley in the BBC-Colin Firth-Jennifer Ehle version of Pride and Prejudice produced in 1995. 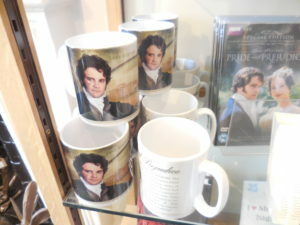 Below, the film inspired souvenirs in the gift shop — mugs, tea towels, chocolates, and the DVD among other treasures. 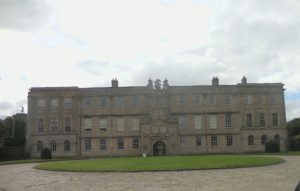 This photo, from Wikipedia, gives a better view of the north facade, which is described in the guidebook as “the exuberant Elizabethan frontispiece executed for Sir Piers Legh VII in about 1570…” There have been about thirteen or fourteen Sir Piers or Sir Peter Leghs in the family’s five-century ownership of the property. 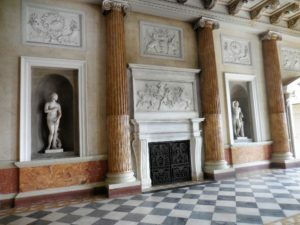 The Courtyard was completed in the early 17th century by Sir Peter IX to the designs of Giacomo Leoni in the Palladian style. On the courtyard sign, we found our instructions. 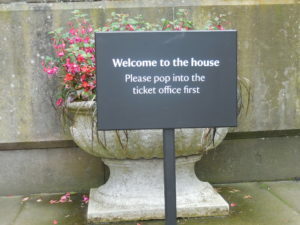 So we popped into the ticket office and showed our Royal Oak passes before proceeding into the house. 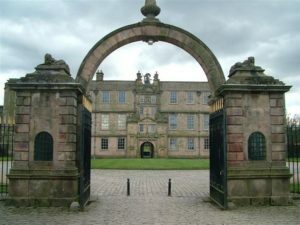 Of course we knew that the Pride and Prejudice 1995 interiors were shot at Sudbury Hall, and thus the Lyme Park rooms were entirely new to us. 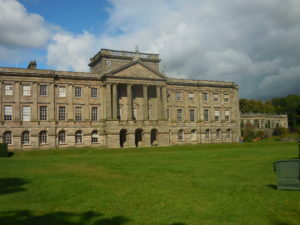 Only exterior shots of Lyme Park were used in that version. 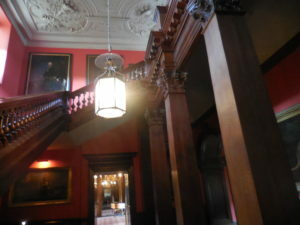 In the Entrance Hall, Leoni remodeled the original Great Hall but retained evidence of the house’s antiquity. 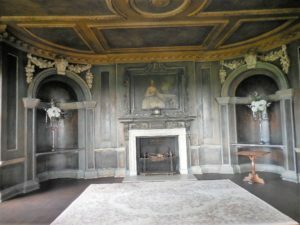 In addition, Mortlake tapestries from the Hero and Leander series, C. 1625, adorn the walls; the room was used as a ballroom from time to time. 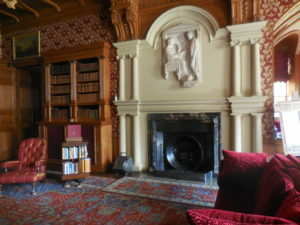 The Library, in the two photos below, is one of those places we want to spend a few days perusing the many shelves of books. Oh to be let loose on those shelves! 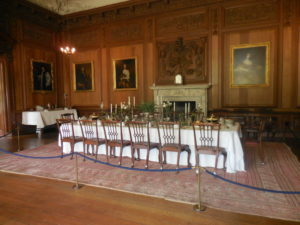 The Dining room was added in 1814 by Thomas Legh in an addition designed by architect Lewis Wyatt on the east front. 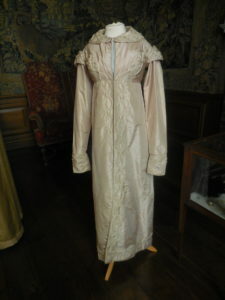 In the adjacent dressing room, we found an exquisite grey silk Regency-era pelisse. 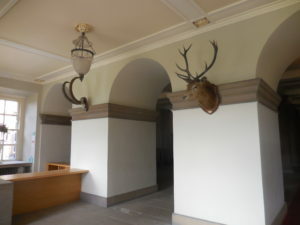 The Saloon sits behind the memorable portico on the South Facade. 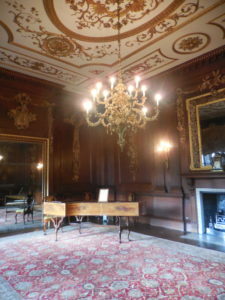 As the principal receiving room, it is paneled in oak and boasts a fine walnut harpsichord by John Hitchcock of London, from the mid 1760’s. 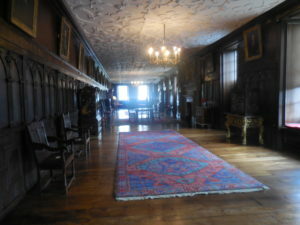 The typically Elizabethan-era Long Gallery, above, on the first floor, was designed for exercise on inclement days and as an all purpose room for family activities, such as amateur theatricals, as well as being a picture gallery. 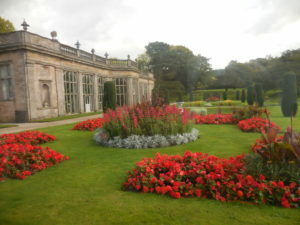 And from the Dutch Garden, you can clearly see that famous Pemberley facade from the film. 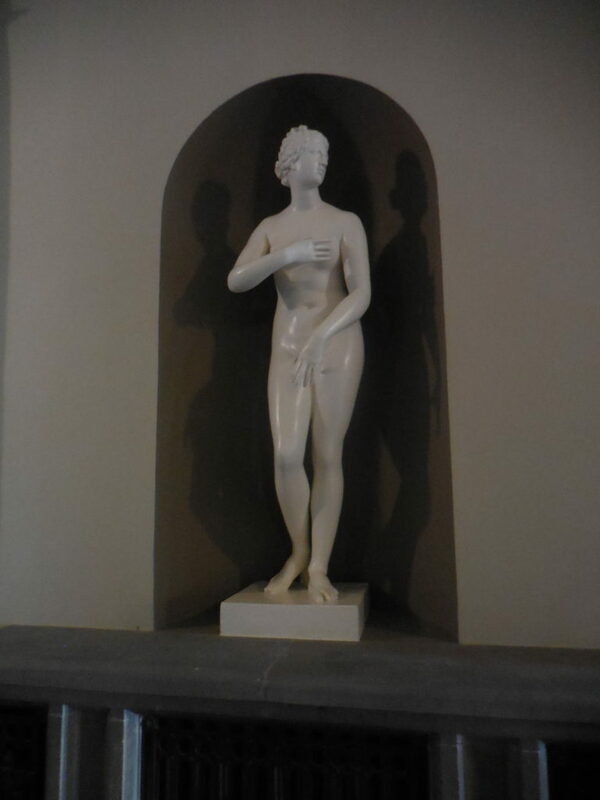 Lyme Park was full of surprises. 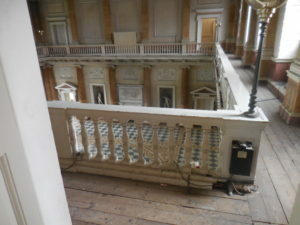 We expected it to be a classic Palladian house, precisely the modern structure Jane Austen described as Pemberley. Instead, we found everything from remnants of its origin as a medieval hunting lodge through myriad design styles to the eclectic combination of today. Yet it all seems of a piece, fittingly so. 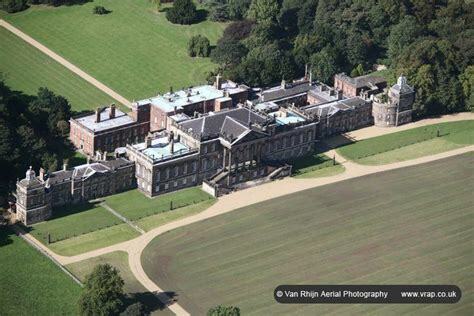 Would you like to visit some of England’s finest stately homes? 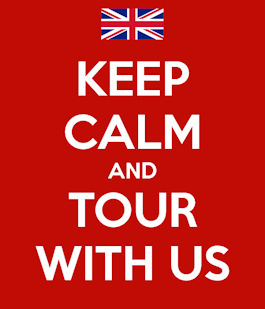 Number One London has another Country House Tour set for May 2019 – complete details here. 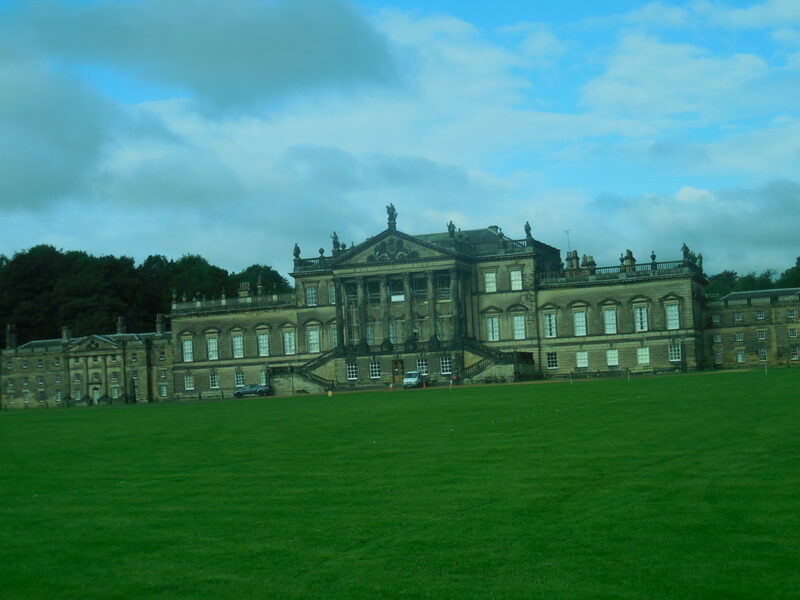 The story of Wentworth Woodhouse (WW) is intensely interesting — and convoluted. 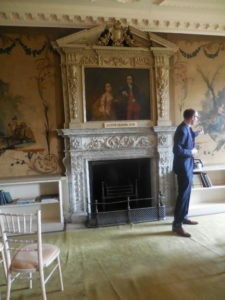 Since I am a great devotee of all things British, and especially the great country houses and the people who lived in them, I was particularly excited to visit the estate with Number One London Tours 2017 Country House Tour. WW has been open to the public for only a few years. 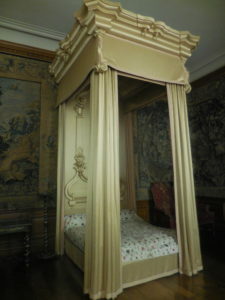 I was eager to see it, reputedly the largest private house in Europe, if perhaps one of the strangest. 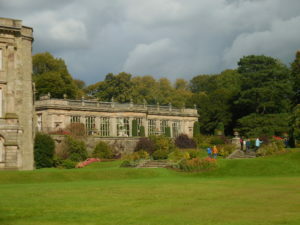 The land has been in the hands of the family since the 13th century. 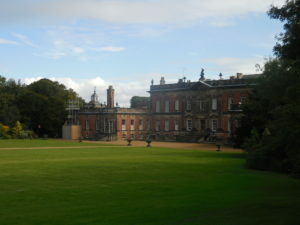 The present structure was begun in the 1720’s by Thoms Watson Wentworth, 1st Marquess of Rockingham (1693-1750), on the site of a previous house. 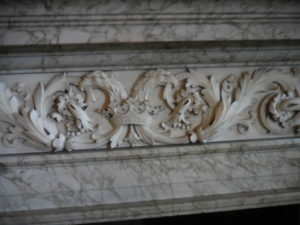 The baroque style, in red brick, did not find favor with the Marquess and his friends among the Whig aristocracy. 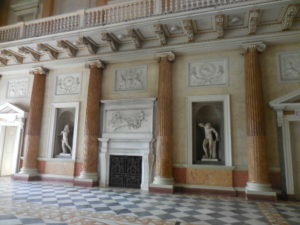 Almost as soon as it was completed, Rockingham built another house, facing West, this time in the Palladian style favored by his social set and political allies. 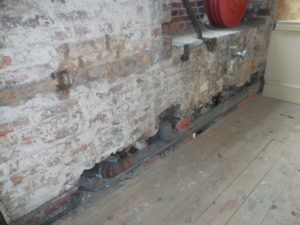 The two back-to-back wings are joined together in an area perhaps saved from an earlier 17th century house. 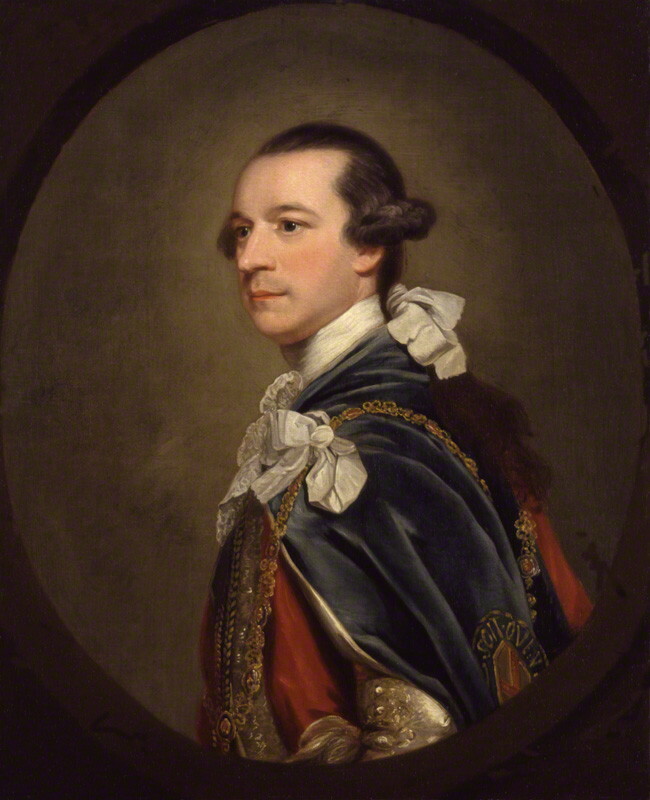 The estate and political influence both went to his son, Charles Watson Wentworth (1730-1782), 2nd Marquess of Rockingham, eventually Prime Minister and holder of numerous public offices. 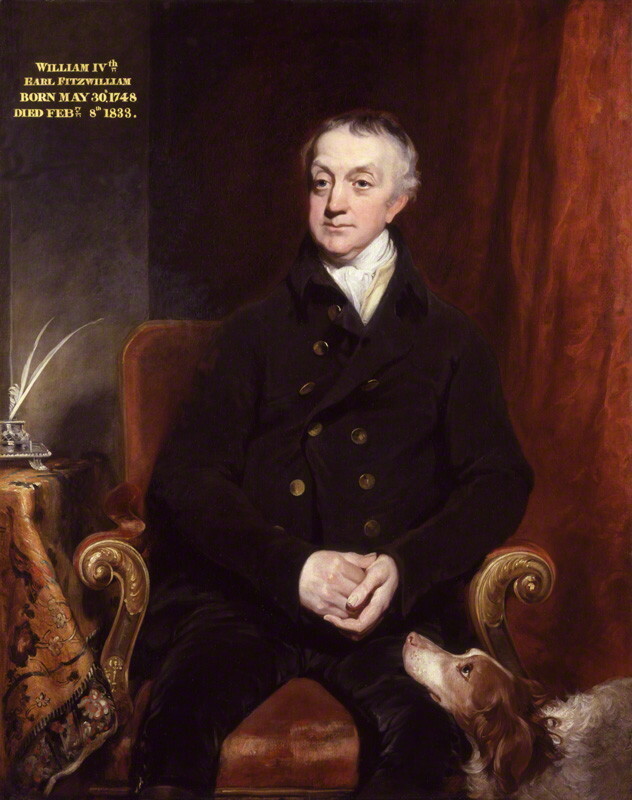 The 2nd Marquess and his wife had no sons; therefore in 1782, the estate passed to his nephew, William Wentworth-Fitzwilliam, 4th Earl Fitzwilliam, and the marquess’s title, Rockingham, became extinct. If most of these names have a familiar ring, don’t be surprised. 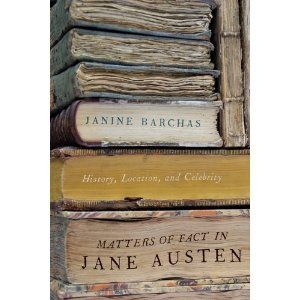 Refer instead to Janine Barchas’ book Matters of Fact in Jane Austen. 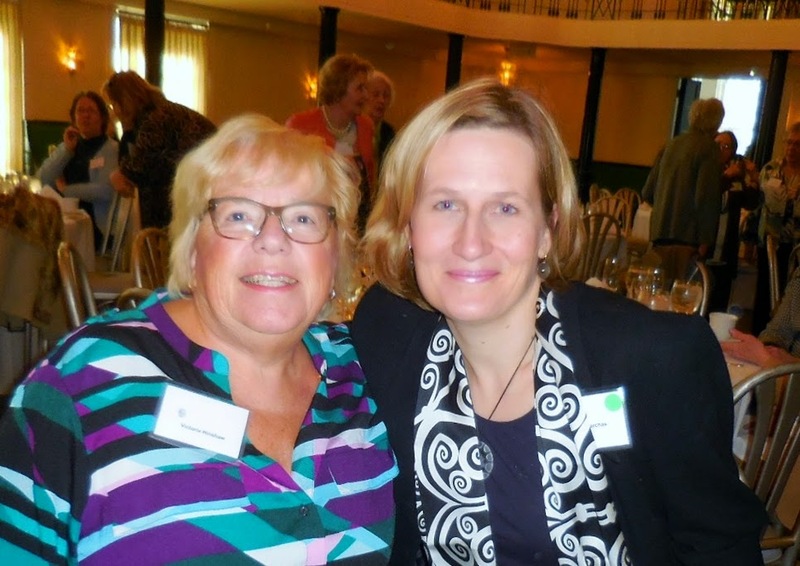 I can’t resist posting the following picture which shows Dr. Barchas and me at a Chicago JASNA event. 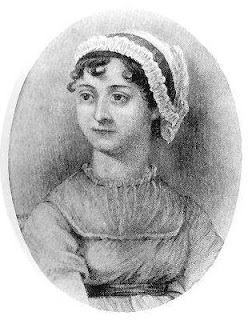 Dr. Barchas traces the origin of many of the family names used by Jane Austen in her novels. 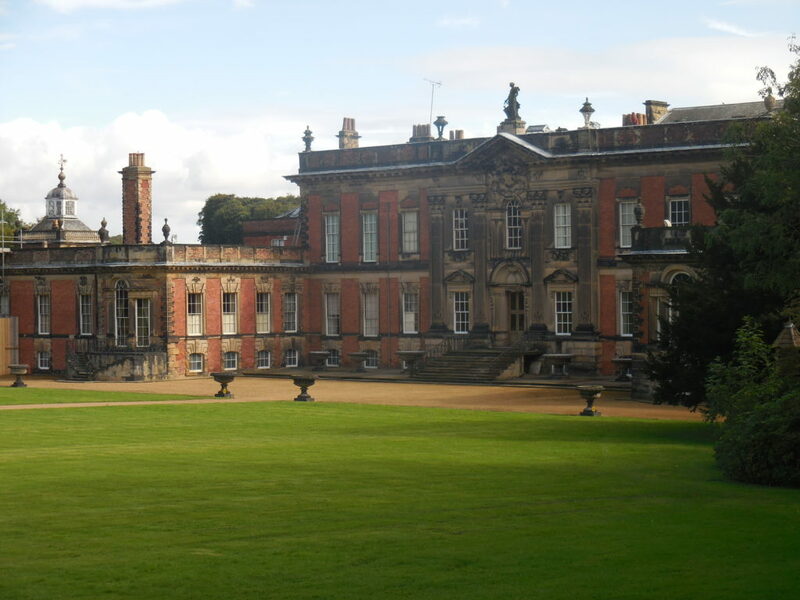 Among relatives of the Fitzwilliams were the D’arcys, as used in Pride and Prejudice. Woodhouse is the family name of Emma. 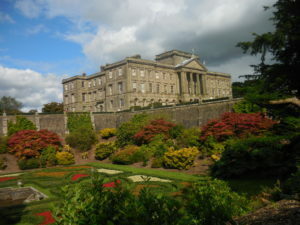 Wentworth is Captain Frederick’s family name in Persuasion. The Watsons is one of Austen’s two unfinished novels. 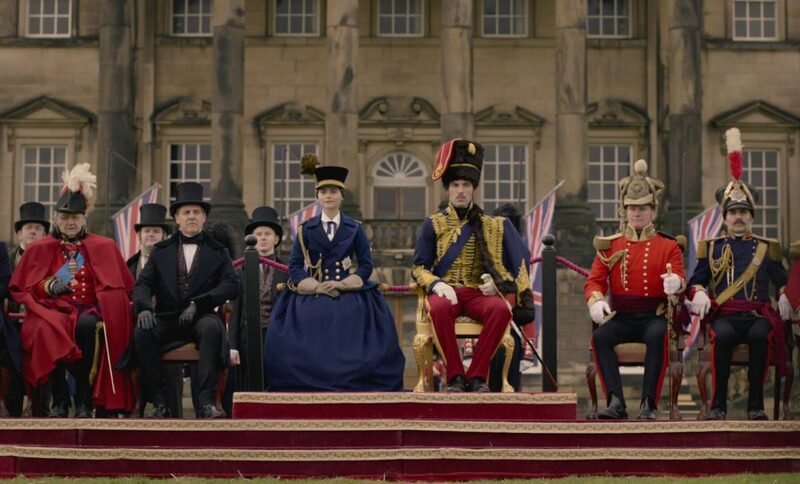 Austen’s contemporary readers would have instantly recognized the names of these leading British families, though 200 years later, they come as a revelation. 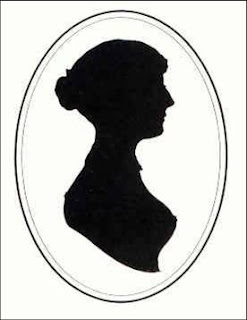 For the source of many other names used by Jane Austen, check the book by Dr Barchas. 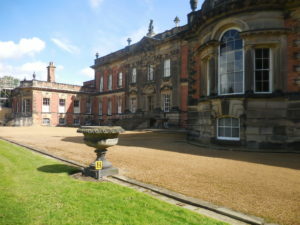 The Wentworth Woodhouse Preservation Trust was established to preserve and restore the estate, after many years of problems and neglect. 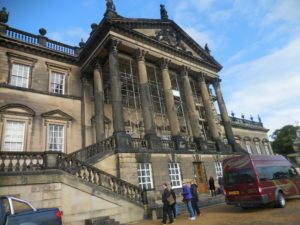 Restoration will be a huge and expensive job, probably aided by the frequent use of the property for film and television dramas. 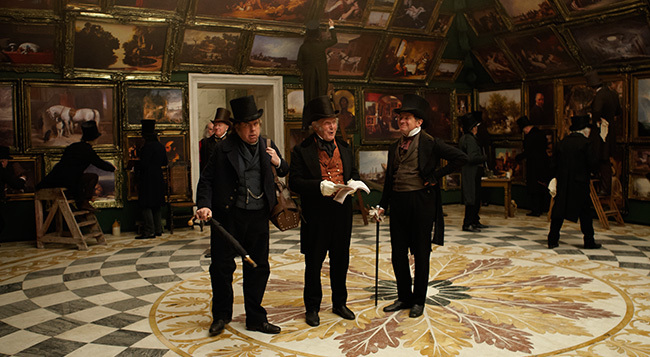 We saw it in Mr. Turner, the 2014 film about J. M. W. Turner, the celebrated and eccentric artist, where the Marble Hall was staged as the annual exhibition of the Royal of Arts — note that floor. 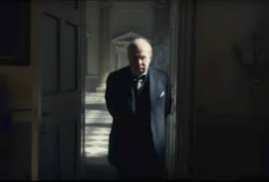 The film Darkest Hour has been highly praised. 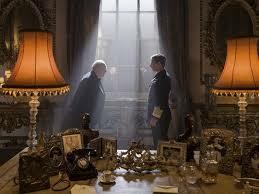 WW stands in for Buckingham Palace where Churchill meets with His Majesty George VI. 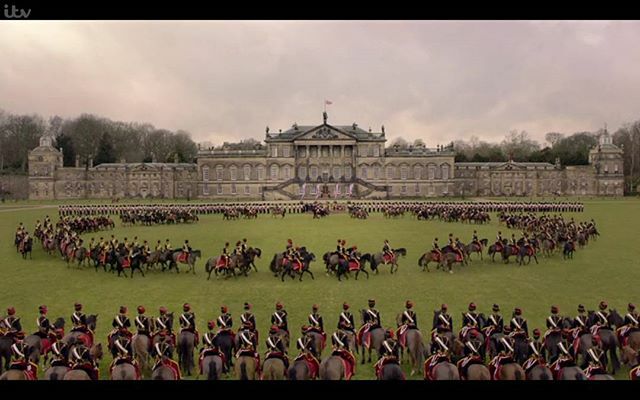 Many scenes in the television series Victoria were filmed at WW, including the review of the regiment on the front lawn. An ariel view of the adjacent houses shows how they are joined, and in that area where they meet are remnants of the earlier 17th-century structure. 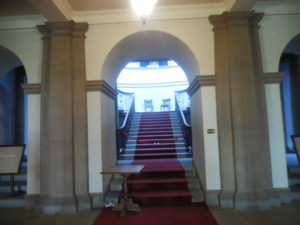 It is estimated that there are five miles of corridors inside. Very little is left of the 1630 house but this garden gateway. 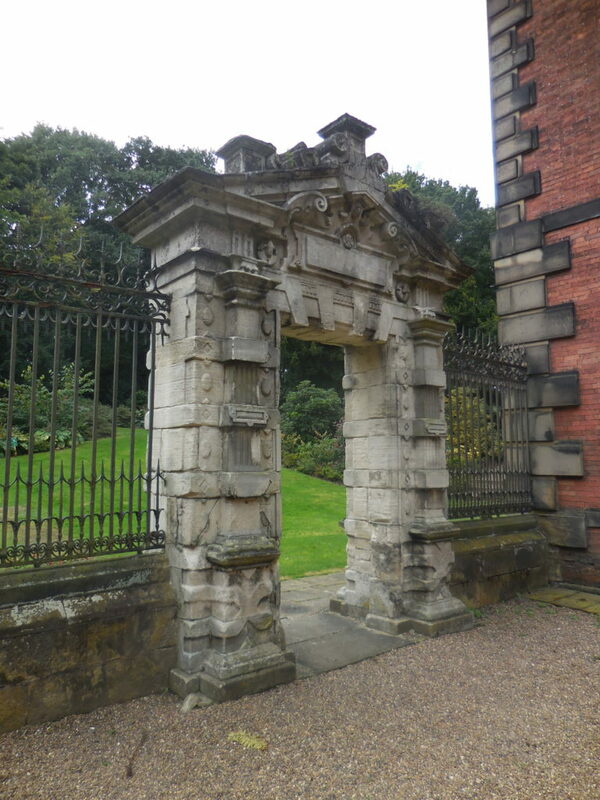 Inigo Jones was probably the architect of this Wellgate. 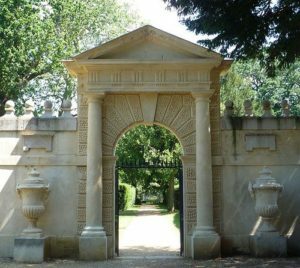 Below, compare it to the garden gate at Chiswick. The previous house built in 1608, of which only traces remain, was otherwise incorporated into one (or both?) of the present houses. Improvements were well underway when we visited in the autumn of 2017. 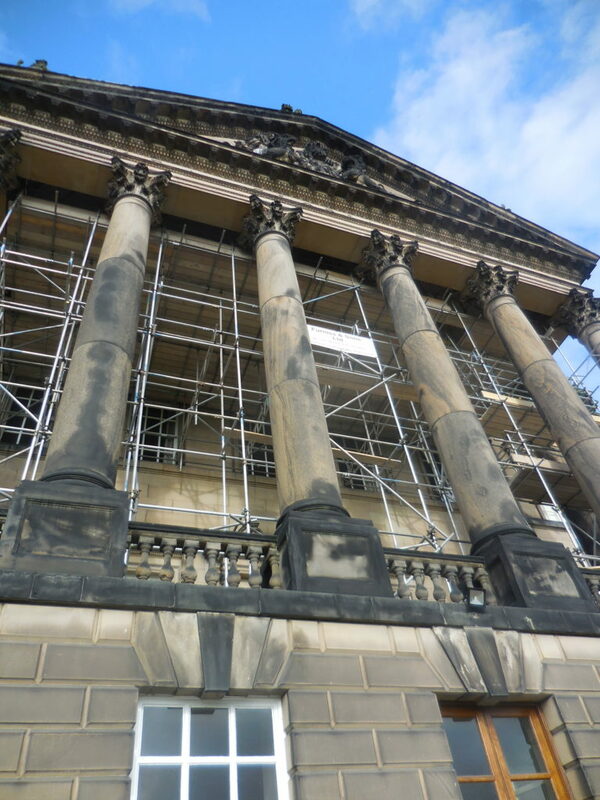 Simply fixing the roof–said to be nearly four acres in size–will take up most of the initial grant from the government of 6.6 million pounds. 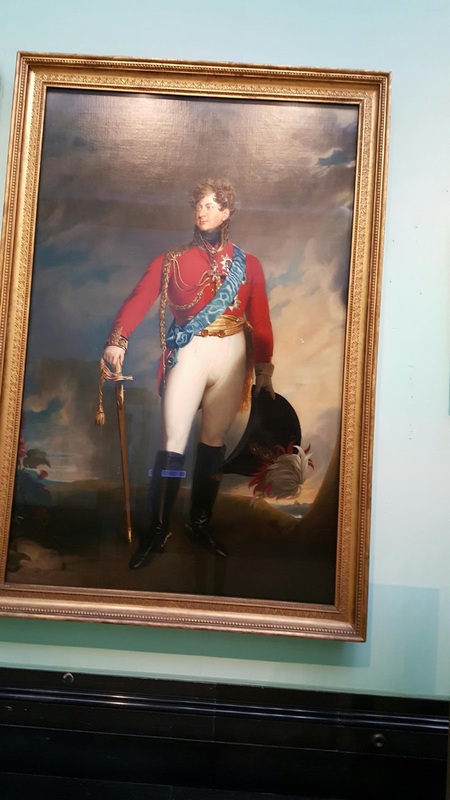 The Fitzwilliam family was one of the richest and most powerful in Britain in the 19th century. 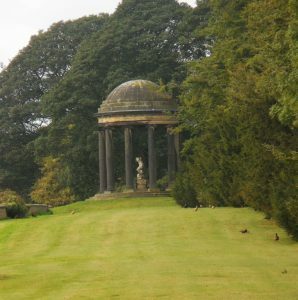 Coal mined on the estate supported them in near-regal style and employed thousands in nearby villages and as tenants on the land. 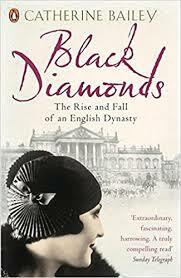 The 2014 nonfiction book Black Diamonds by Catherine Bailey reads like a novel as it relates the dramatic ups and downs of the estate and its residents. Highly recommended. 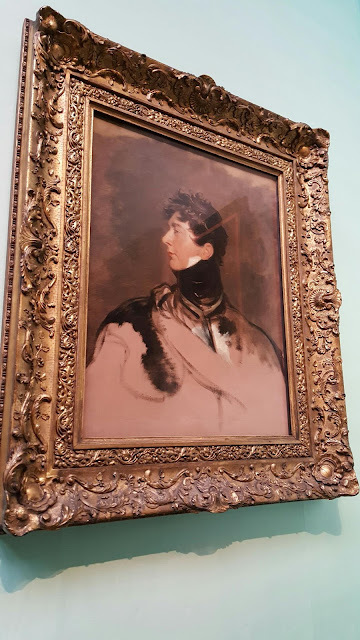 If you will permit another aside, the story of the last 8th Earl Fitzwilliam, has interesting features. 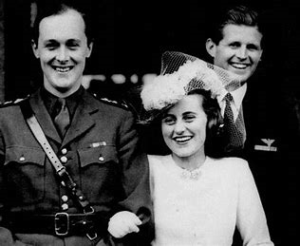 His romance with Kathleen “Kick” Kennedy was frowned upon by the very Catholic Kennedy family, especially by her parents, who were none too pleased when Kick converted to the Church of England. Nevertheless, they married in May 1944. Only her older brother Joe attended the wartime wedding. Just four months later, Billy was killed in action in Belgium. 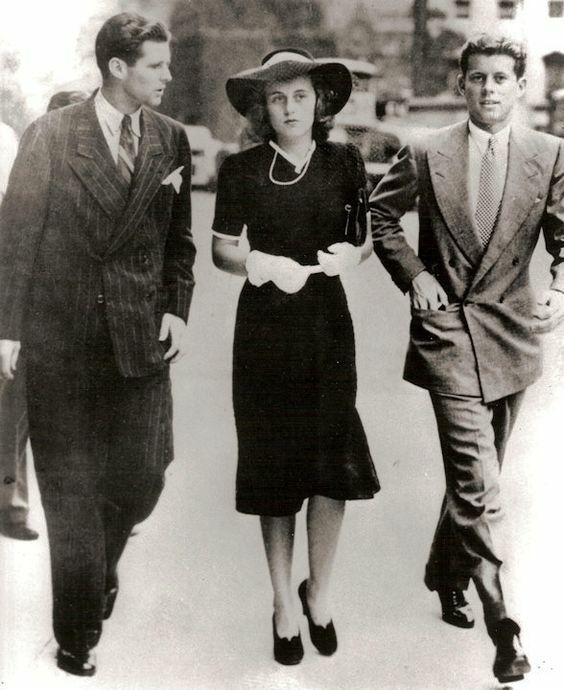 Joe, eldest of the Kennedy brothers, died in August 1944. 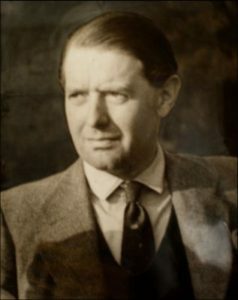 The widowed Kathleen later began a relationship with Peter Wentworth-Fitzwilliam, 8th Earl Fitzwilliam, who was married and the father of a daughter. Kick and Peter died together in a plane crash on their way to the Riviera in 1948. 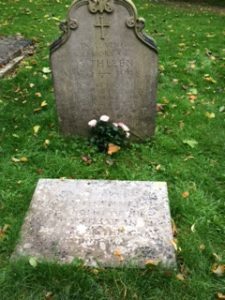 She is buried near Chatsworth in the churchyard at Edensor, another of the ill-fated Kennedy children whose lives have been so tragic. 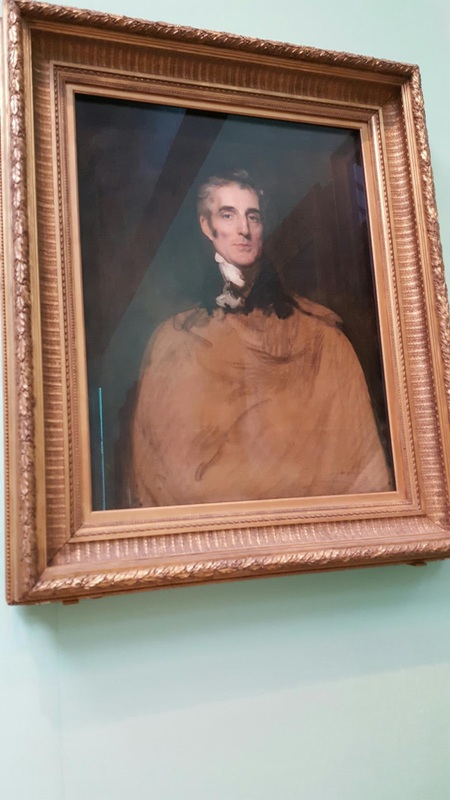 Upon the death of Billy, Andrew Cavendish, second son of the 10th Duke, became the Marquess of Huntington and eventually the 11th Duke of Devonshire. 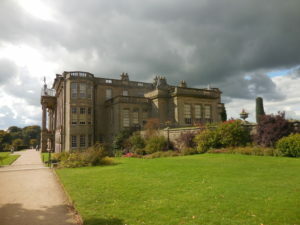 His Duchess, Deborah, nee Mitford, was particularly instrumental in making the family estate of Chatsworth in Derbyshire, into one of Britain’s premier stately homes. 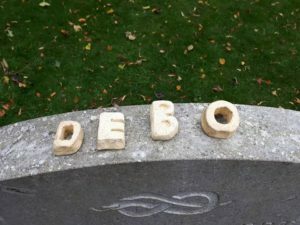 Deborah, or Debo as she was familiarly known, was the author of many books, died in 2014 at age 94. 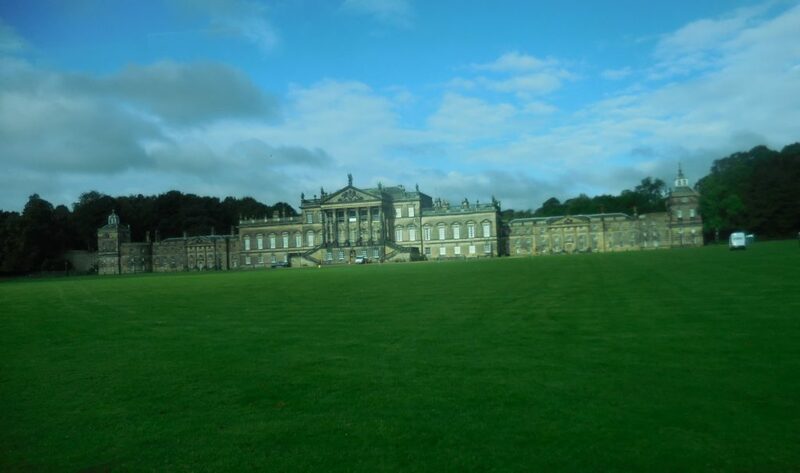 The complex story of Wentworth Woodhouse is far from over. 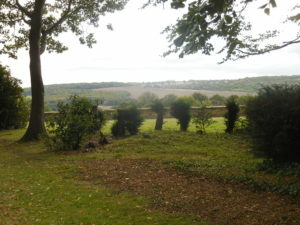 At the death of Peter Fitzwilliam, the estate was undergoing extensive strip coal mining, sometimes right up to the door, which weakened the house foundations as well as ruining the gardens. Postwar austerity and crippling death duties required putting the house on the market, and who, pray tell, might want to own such a white elephant? 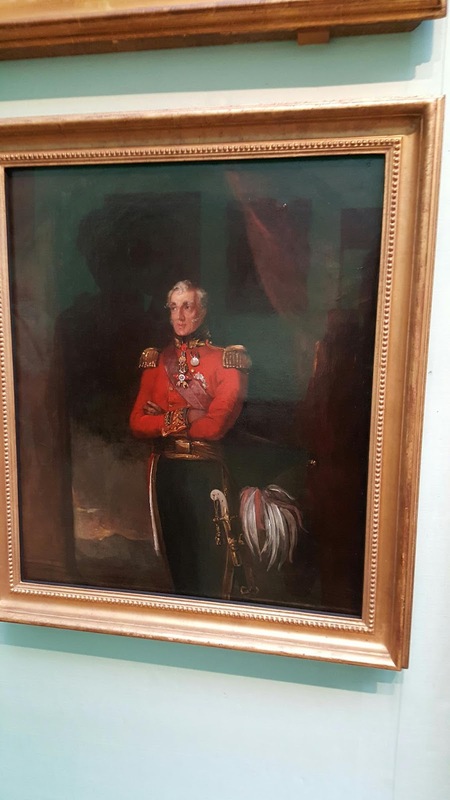 Most of the furnishings were auctioned and eventually the property was leased to Lady Mabel College for the training of female physical education students. 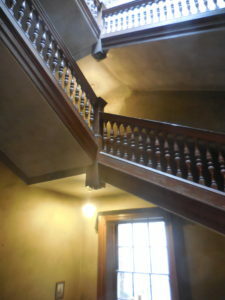 After several decades of changing ownership and sporadic attempts to halt deterioration, in 2017 the WW Preservation Trust acquired the property and a grant for the renovation of the house. They have a daunting task at hand. 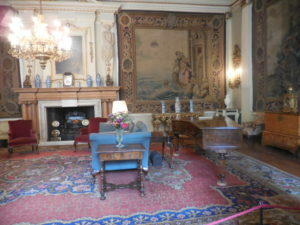 When we visited, only a few rooms had furniture, and evidence of sinking accompanied general decline. 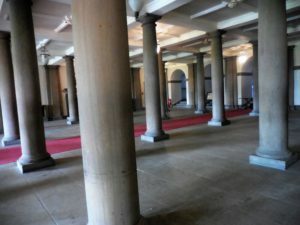 This forest of pillars on the ground floor supports the Marble Saloon above. 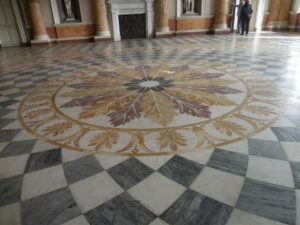 Upstairs, the room is magnificent, particularly the patterned floor. 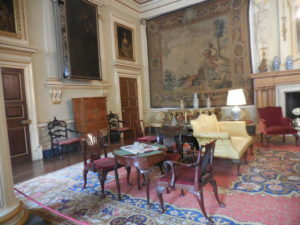 Most of the rooms are without furnishings or temporarily provided with furniture for meetings, parties, and conferences, by which the Trust hopes to help fund restorations. 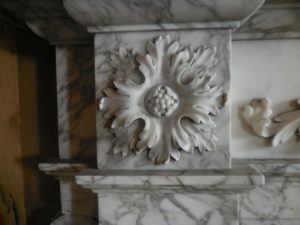 But the remaining features of the house are stunning, as in the details of this fireplace surround. 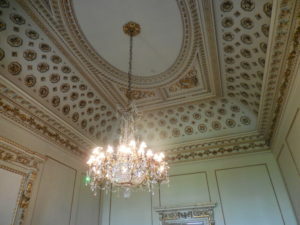 The Van Dyck Room boasts a magnificent chandelier. 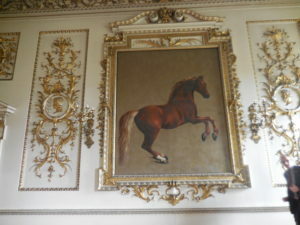 The Whistlejacket Room continues the white and gilt decor; it is named for the painting above (though it is a copy) by George Stubbs , c. 1762, of a famous racing stallion owned by the family, Whistlejacket, winner of many races. 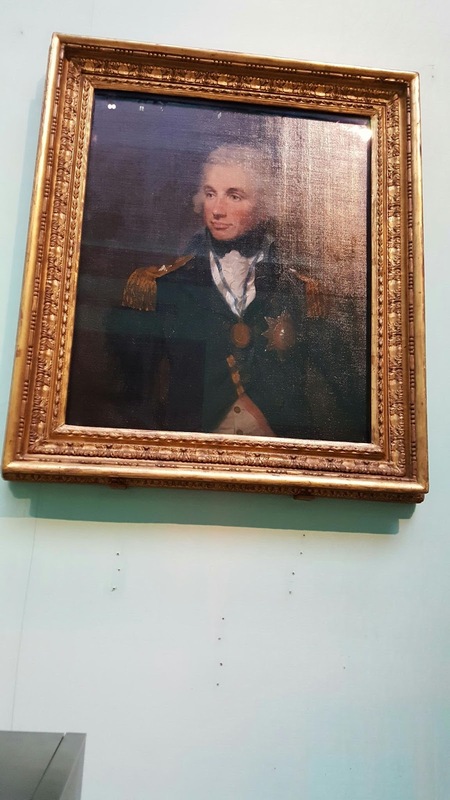 The original Stubbs work was acquired by the National Gallery in London, where the original now hangs, for £11 million in 1997. 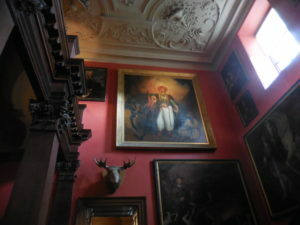 Upstairs, most of the attractive decor came to an abrupt halt. 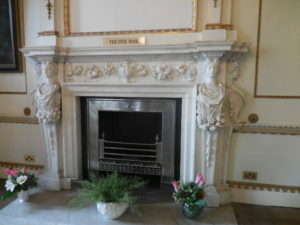 One room was preserved as it would have been for a student at Lady Mabel College in the 1950’s, but I am sorry to say I missed taking a shot there. 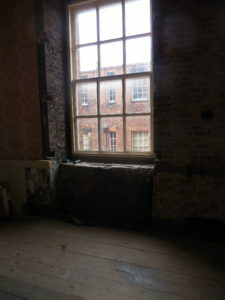 Most of the upper floor was in need of considerable restoration. After touring the chapel, we went outside to see where and how the two houses were combined with remnants of the original house built a century earlier. 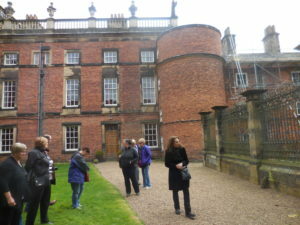 By this time, I believe our tour participants were gob-smacked by the size and condition of the estate. But even more was ahead. 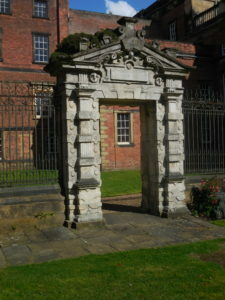 The gateway, reputedly by architect Inigo Jones, remains from the old house. 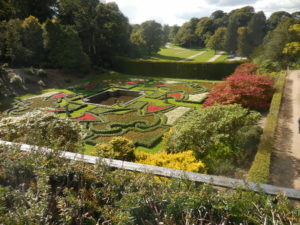 The Gardens are in need of considerable restoration also, but the land itself is interesting and worth seeing. 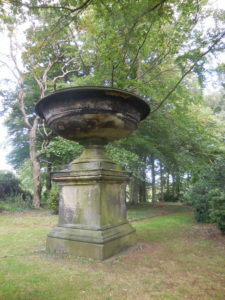 Some garden decorations remain. 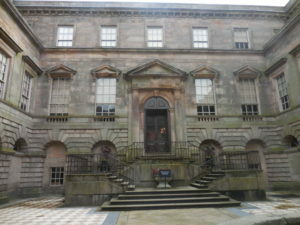 At last we were far enough away to achieve a perspective on the lovely West facade, the baroque house. Here I am in the snowy midwest of the United States (that country born just after you), 242 years after your birth, expressing my thanks to you for all your talents and achievements. I can only hope that somehow you are aware of the esteem in which you are held by millions of people. 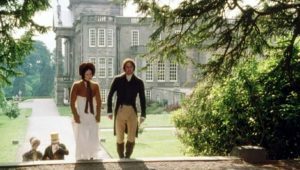 Are you surprised that your novels are still adored 200 years after their publication? And that you are celebrated as one of English Literature’s most famous authors? How do you account for the fact that many of us call ourselves Janeites? That we gather yearly in several countries to discuss your work, from the earliest of juvenilia to the final letters, prayers and poems you wrote just before your demise? 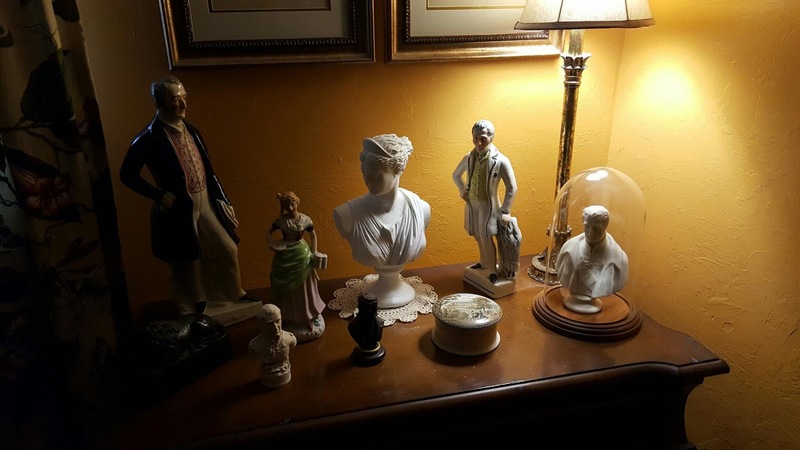 That we scour your words, the accounts of relatives and friends, the objects you touched, your travels, your acquaintances, and every scrap we can uncover that might relate to your life? That universities devote entire courses of you? And that your work has provided the backbone for a whole industry of films, television series, sequels, continuations, contemporary interpretations, and scholarly treatises? 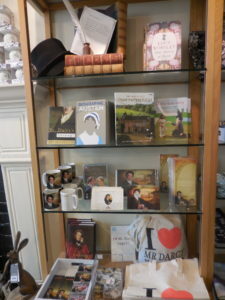 I wonder how you would like to visit Chawton Cottage and see how it has become a shrine to you and your books? 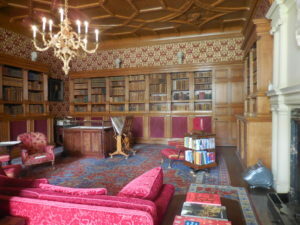 Or Chawton House, where the mansion has been restored to its late 18th century appearance and is now a library of women’s writings before 1900? 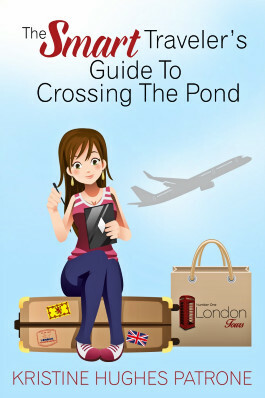 I would not recommend that you travel the streets of London to see the blue plaques on the buildings where you stayed with Henry — it’s far too dangerous unless you have a blue badge guide and skillful driver. Of a car, not a chaise. Would you believe that among the most popular reasons that people visit Stoneleigh Abbey, Netley Abbey, The Vyne or the Wheatsheaf Inn is that you were there? 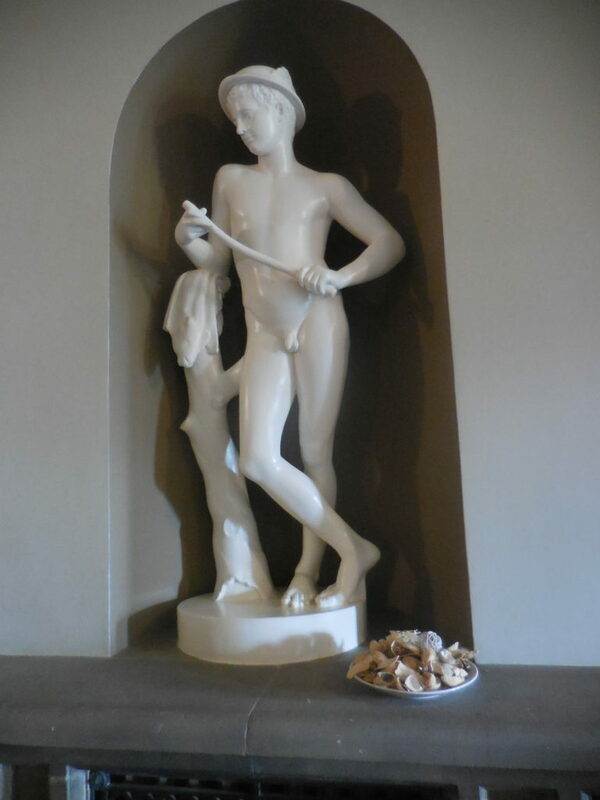 Or that one of the highlights of my life was to eat an apple in the garden of Chawton House when the gardener told me it was from a tree which you probably knew and from which you sampled the fruit. I wasn’t alone either. And were you lingering high in the lofts of Winchester Cathedral when JASNA held a service dedicated to your memory, and that was only one of many so held in that great place? I hope you died in the knowledge that your family loved you and that someday you would be commemorated worldwide. Perhaps some of us have overdone things a bit and owe you an apology. Zombies, vampires, sea monsters, as well as highly fantasized so-called bio-pics have played fast and loose with the facts of your stories and your life. 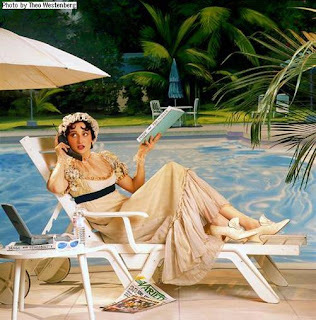 But through it all, we know, if we love Jane Austen (and we do! 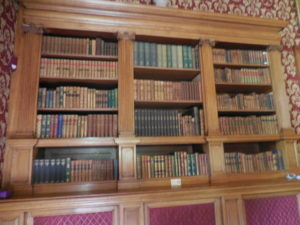 ), all we have to do is pick up a copy of one of your books and immerse ourselves once more. Most of all, I want to express my gratitude for the brilliant way you have enriched my life and that of many of my friends. 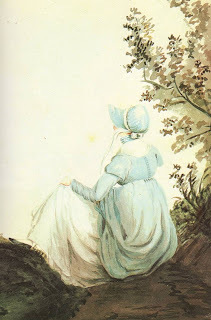 You are one of a kind, Jane Austen, and we are so lucky to have “known” you. Thank you, Jane. 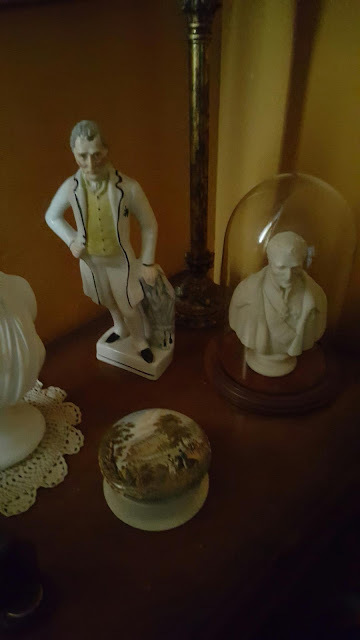 Author Kristine HughesPosted on December 16, 2017 November 16, 2017 Categories Jane Austen, Uncategorized, Victoria Hinshaw2 Comments on HAPPY BIRTHDAY JANE AUSTEN! 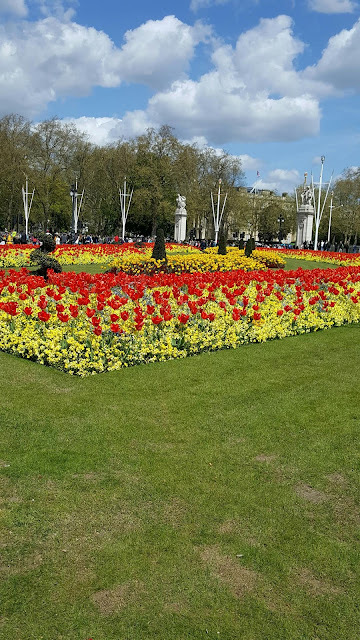 skirted St. James’s Park and noted all the glorious gardens in full bloom, above and below. 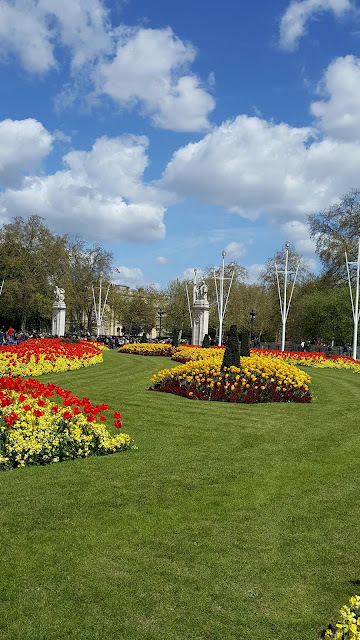 Crossing the Mall, we then walked up the path that runs along Green Park up to Piccadilly, but instead we turned in at Milkmaid’s Passage as short cut through to St. James’s Street. mine in St. James’s Street. 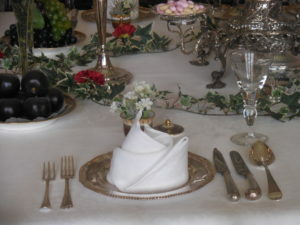 In fact, I like it so well that I’ve included it on the itineraries for several upcoming tours as a dinner venue. 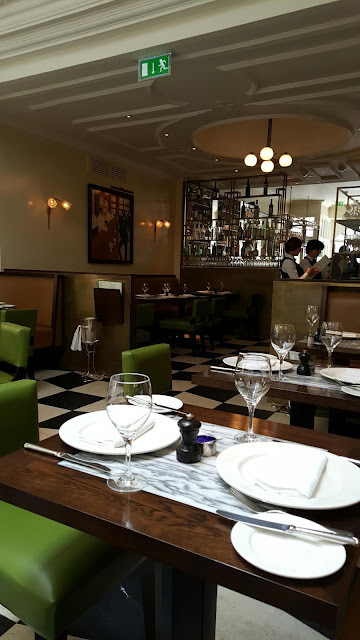 The restuarant is a revival of Marcel Boulestin’s pre-war venue in Covent Garden and has achieved the perfect blend of modern chic, French flair and historic touches. 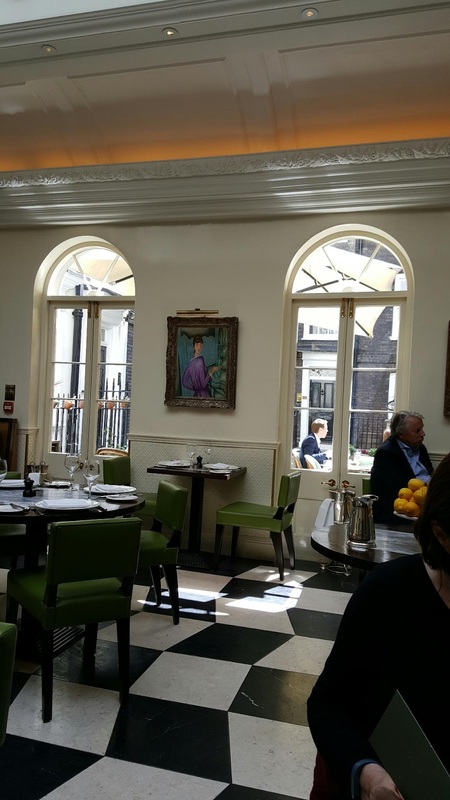 Click here to read about the original restaurant, the most expensive in London, and about chef Marcel Boulestin. In the photo above, you can see the outdoor seating area which is in Pickering Place, which is also adjacent to Berry Brothers and which was also the site of the last public duel in England. 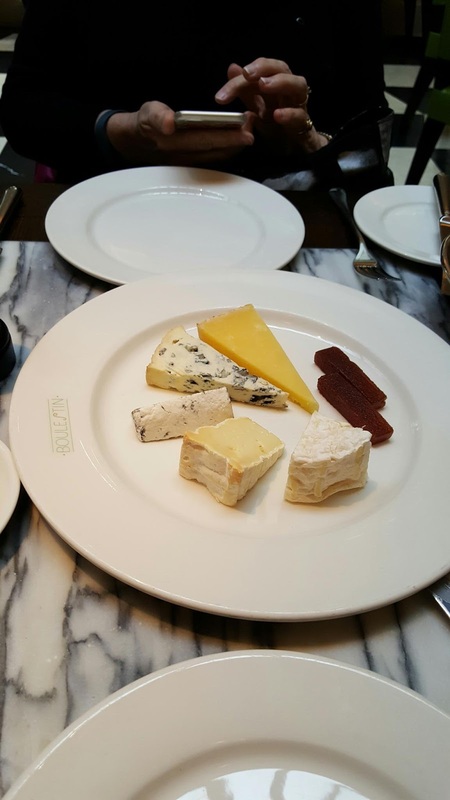 Diane and I each had a bowl of homemade soup and shared a cheese plate afterwards. Delicious! 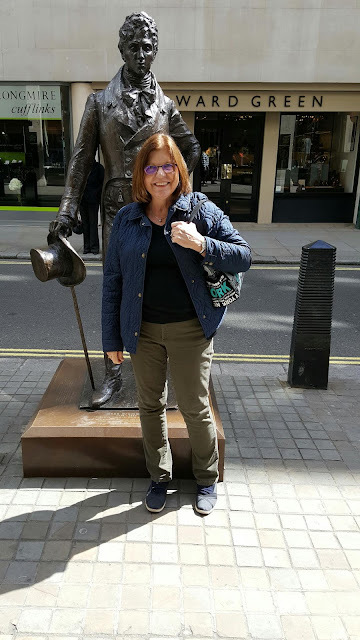 Afterwards, we detoured through Jermyn Street in order to pay a visit to an old and dear friend. whose shop is in Cecil Court. After pouring Diane and I a glass of wine each, it was at least a half hour of catch up before we got to the business at hand – Artie-facts, the true reason for our visit. As usual, Mark had found me another Wellington for my collection, and what a corker! As you can see, he’s right at home now and fits beautifully into the collection. 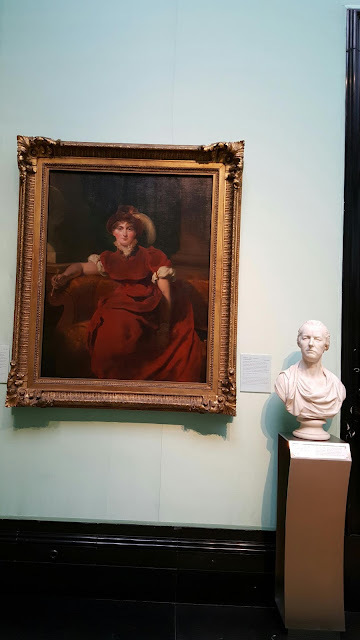 We decided to end the afternoon seeing even more of our pals, so Diane and I headed over to the Regency section at the National Portrait Gallery. Victoria here, catching up with the owner/publisher/editor of JARW. 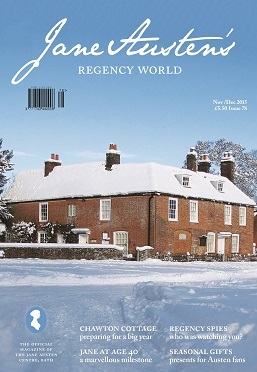 Jan-Feb 2016 issue out now! 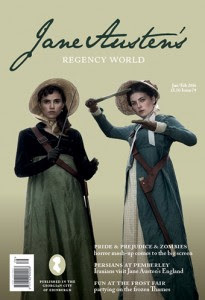 The magazine’s website is here. To Subscribe, click here. 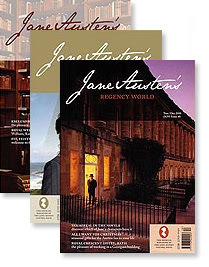 Tim Bullamore, the publisher of Jane Austen’s Regency World, is a charming friend and entrepreneur in journalism. 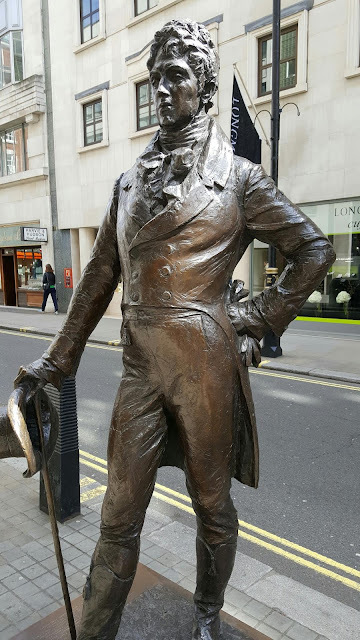 I had the good fortune to interview him at the Jane Austen Society of North America’s Annual General Meeting held recently in Louisville, Kentucky. Tim’s recent Telegraph obituary of composer/conductor Pierre Boulez is here. Tim must have to consult his calendar every day to see where he has to be, for his schedule sounds amazingly complicated to a person like me who just sits in front of a computer most of the day. 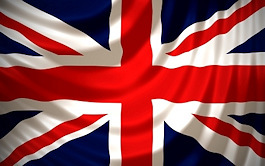 He is a busy journalist, spending several days a week in London as the copy editor for the London Times. He write obituaries for the Daily Telegraph about classical musicians. 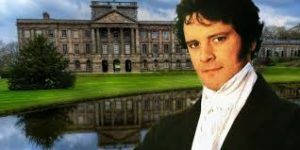 And, in addition to various teaching assignments, he is the editor and publisher of Jane Austen’s Regency World Magazine, which comes out six times a year. And just to provide more variety, his wife holds a university teaching position in Scotland. Are you surprised this is my favorite of all Tim’s excellent cover images? We chatted in the busy emporium at the Louisville AGM where Tim manned a table covered with back issues and subscription forms. He told me how his friends were running the Jane Austen Centre in Bath a few years ago. They confided that their magazine, then part of the Centre’s program, was becoming difficult for them to manage. 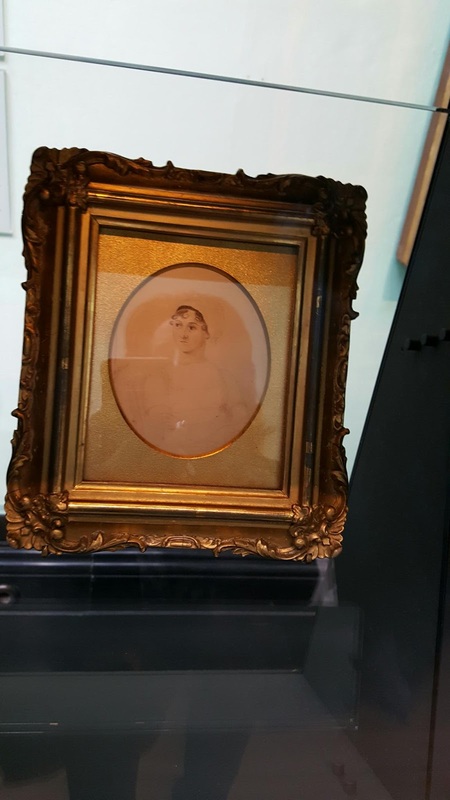 Being a lifelong admirer of Jane Austen, Tim looked into the financial aspects of running the operation and bought it. In the eight years of his leadership, the magazine has excelled in providing interesting and entertaining articles about all aspects of the English Regency and new insights into our favorite author. 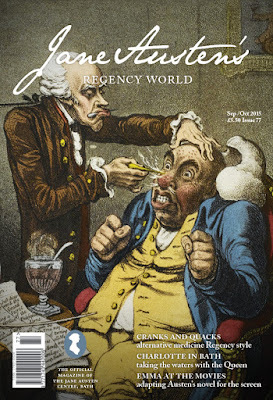 Not to forget the colorful illustrations — and news of JA-related events. 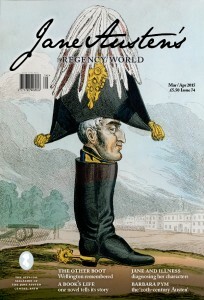 He is proud of the quality of the printing and binding as well, indeed every aspect of the magazine’s production. using science to treat disease; Article by Penelope Friday. The content of the magazine ranges among academic and historical subjects, Jane Austen’s life and times, the mania for Regency dancing, Jane Austen in popular culture, including fan fiction, thus appealing to a variety of audiences. Tim gets a few moments of relaxation in between interviews and courting prospective subscribers. He spends about a day and a half each week on JARW, working with a small sales staff and editorial consultants. including the renowned Maggie Lane who has written many articles and books on myriad Jane Austen topics. Time says that as a niche produce JARW has reasonable advertising rates, providing about 20% of income. The rest relies upon subscriptions. Tim has attended Jane Austen Society events in England, Australia, around Europe, and across the U.S. and Canada. 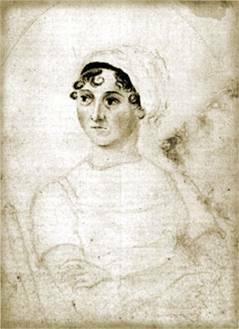 His first JASNA AGM was in Chicago where he was delighted to receive a warm and enthusiastic welcome from North American Austen fans. 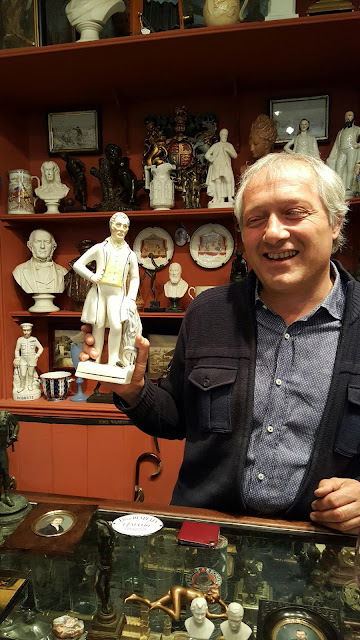 He has spoken at several events, including a talk on obituaries in the time of Austen, and a thoroughly tongue-in-cheek “Defense of Mr. Wickham,” (in Minneapolis, 2013) which to his surprise, several listeners took quite seriously. 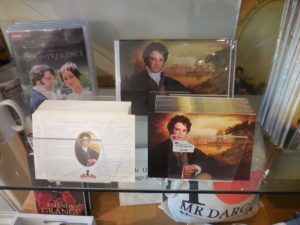 I found it hilarious, casting Mr. Wickham as the victim of Georgiana Darcy’s unsuccessful seductions. Who could say it better than that? Thanks for an engaging chat, Tim. I look forward to another year of reading pleasure.